Home/ Waiter, there’s somenthing in my… bread! 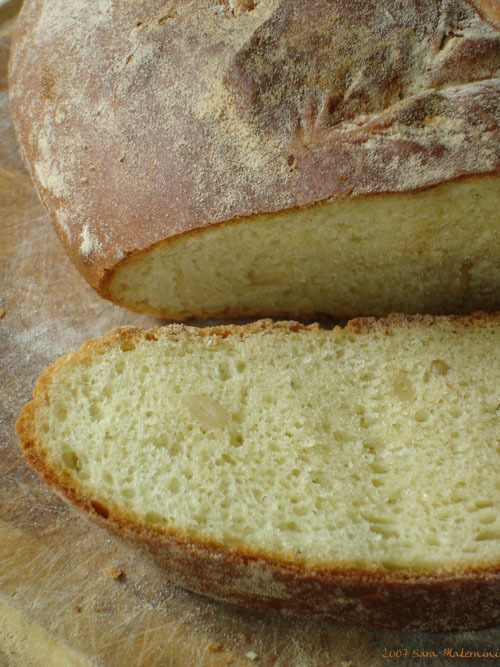 This bread is a complete invention: I had some provolone piccante and some pine nuts in the fridge (the pine nuts were in the fridge because I’ve toasted them some weeks ago…) and I wanted to use them together. And as the thyme is blossoming on the balcony, I added some fresh springs… Et voilà! In the kneader bowl crumble the fresh yeast, add sugar and dissolve everything with the warm water. Once the yeast is begging to bubble, add strong flour, semolina flour, 300 g of hard wheat flour, cheese and thyme. I haven’t added salt because the cheese is very savory. Knead until you have a nice and silky ball, adding more flour if needed. Transfer the ball in a glass bowl, cover it with film and let it double in a warm environment (45 minutes – 1 hour will do). Once the bread is doubled, punch it and work it a bit, then resize it in a ball and lay it on a floured baking tray, covering it with the glass bowl upside down. Let it rise for 30 – 45 minutes. Once is well risen, dust the surface, make criss cross cuts, and cook it in the oven for 30-35 minutes, or until knocking on the bottom you can hear an empty sound. Mmmmm, I love cheese breads. Hey, Sara, I can see you really got inspired! This is some fantastic bread! P.S. : I think the name of the event is funny, too. Cute funny, I mean. Oh my, the bread looks fantastic. Hi Sara! 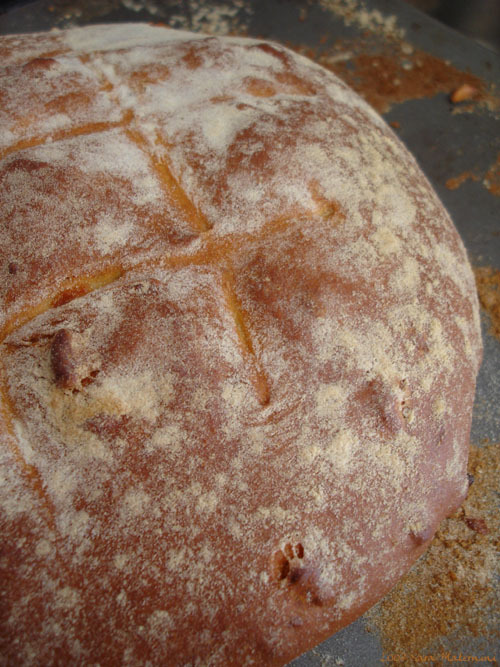 Now, how wonderful does your bread look? Che grande!